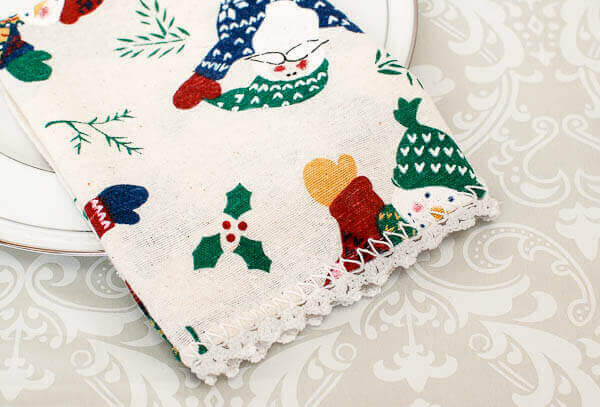 These Lace Trimmed Napkins are so quick and simple that you can easily stitch up a set for your own table or to give as gifts. Best of all, you can use the crochet edging pattern on just about any fabric napkin set you like, no matter what the season!! If your napkins don’t already have stitching around them that you can crochet into, you will want to use a needle and thread to work a blanket stitch around them. 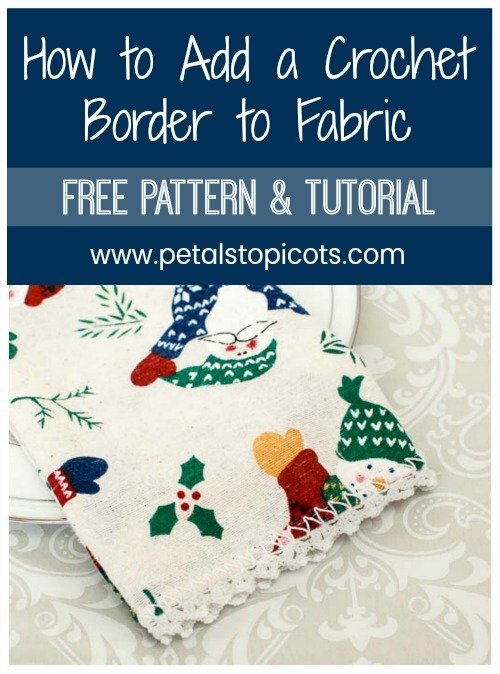 If you are not familiar with blanket stitch, you can follow my How To Do a Blanket Stitch tutorial here. If you prefer, an alternate option would be to use a piercing crochet hook to edge the blanket as I showed here for adding edgings to fleece blankets. Work an odd number of blanket stitches along each edge of your napkin that you would like to crochet. Picot: Chain 3, slip stitch into third chain from hook. 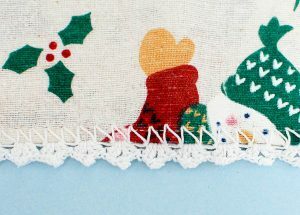 Edging: Pull up a loop in first blanket stitch. Ch 3 (counts as dc), work [1 dc, picot, 2 dc] in same st, skip next st, *work [2 dc, picot, 2 dc] in next st, skip next st, repeat from * across ending with [2 dc, picot, 2 dc] in last stitch. Repeat on each napkin edge if desired. Click here for more Crochet Borders & Crochet Edging Patterns .